A fiscally constrained government, such as we have, cannot afford to distort markets in area where they are potentially efficient and create inefficiencies by its commission or omission. The social cost of such market distortions is high on society, the economy and general public welfare…the Buhari government…must embrace real economic pragmatism and allow markets to function if it will make a difference in reversing the economic downturn. If there is any lesson the Federal Government must learn from the lingering petrol crises, in the unabated long queues at our petrol stations, it is that that a government cannot substitute itself for the market no matter the depth of its patriotic intentions. From the management of the foreign exchange to petrol markets, we see an economic management paradigm that markets do not matter, that a government can take over the fundamental functions of markets from the supply of goods to the determination of demand and the ultimate fixing of prices. Nothing illustrates the fallacy of this economic paradigm more than the current petrol crisis. When economic goods are mechanically and artificially priced below their true economic value, the effective and efficient functioning of markets are distorted, supply dries up and demand becomes over-bloated. This leads to secondary and parallel markets where economic goods will ultimately find prices closer to their true value. The few privileged elites who control supply benefit from inevitable rents, while the market becomes inefficient, and productivity and economic output ultimately decline. It will be useful to estimate the productivity loss and output decline occasioned by the current petrol crisis in all sectors of the economy, including small businesses and the impact on the quality of life of Nigerian households. If the economic and output implications of a fixed pricing of foreign exchange are not as clear, it should be clearer with the petrol product crisis. Essentially, the fixed price of petrol below its economic value creates little incentive for the private sector to participate in the petrol market, leaving virtually the NNPC as the sole supplier. Despite all patriotic intentions and the best of logistics management, the NNPC alone has been unable to cope with and meet national demand. If any government must be open to the market logic, it should be the one operating in a time of heavy fiscal constraints like the current administration. In a period of fiscal abundance, a government might have the resources to call the bluff of markets, even controversially so, but certainly not in a period of fiscal constraints when the private sector resources need to be deliberately courted and mobilised to complement constrained fiscal supplies. From Venezuela to Nigeria, we see the same challenge of the anti-market economic policy and its negative effect on output and employment. A genuinely patriotic Hugo Chavez could call the bluff of markets when oil prices were high in his days in Venezuela, but not the current Maduro government operating within a period of low oil prices and heavily constrained fiscal state resources. Outputs have shrunk; inflation and unemployment have skyrocketed in Maduro’s Venezuela. Shops are empty and there are typical long queues for basic essential groceries. 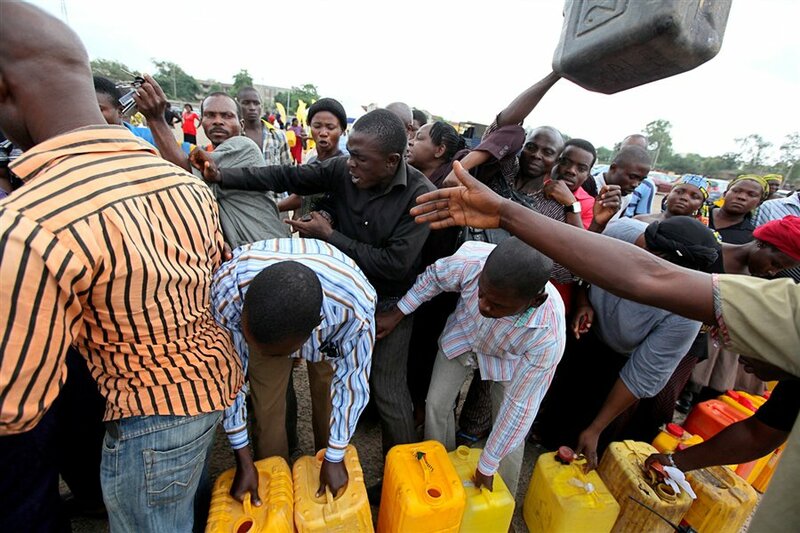 Like Zimbabwe with the same unorthodox economic policies, we in Nigeria are now beginning to queue perpetually for fuel, queue for forex, and queue for electricity. As it affects the petrol and forex markets, the same issues affect the infrastructure and power markets. The Works and Power minister has lamented that while his ministry needs two trillion naira to complete just the road projects inherited from the previous administration, his ministry will at best have just about N400billion from the budget, which is expected to finance road construction, including investments required to radically upgrade our power infrastructure. It should be obvious that if we do not get our power markets to work with the right pricing of economic goods that provide sufficient incentives for private investments from home and abroad, we should say good-bye to serious improvement in our electricity situation. Babatunde Fashola, despite his good track record, may be potentially demystified by the current government economic policy. The wealthy benefit more from petroleum product subsidy than the poor. The petrol product market will be more efficient if pricing reflects the true economic value at equilibrium prices that balance demand and supply. At true economic prices, demand will reduce to match available supply. This will solve the lamentation of the State Petroleum minister that thirty percent of our fuel imports are ferried across the border to Cameroun and Chad where petroleum product prices are closer to their economic value. It is not that markets are always perfect and cannot fail. There are in fact critical instances where markets fail and their dysfunction necessitates the intervention of the state to protect the poor and the socially vulnerable. State intervention in markets may also be necessary to enforce rules and positive regulations that ensure market transparency, promote fair markets and the limitation of excessive market power that are critical to the efficient functioning of markets. In the case of public goods like education and health, where the social benefits of investments are far bigger than private returns to capital, when private capital will not sufficiently invest in public goods, the state must intervene to correct market failure to ensure the protection of the socially vulnerable, the poor and the larger society. The state will achieve this by driving public investments in social services, including the provision of subsidies targeting the socially vulnerable. Such public investments and social subsidies, especially in a fiscally constrained state, must be appropriately targeted to ensure that they are going to only those who deserve such subsidies; those who cannot afford to pay commercial prices. Designing such social subsidy programme can be very challenging, as we saw in the petrol subsidy programme, as well as in the current forex allocation programme, which is effectively a social subsidy programme to buy the dollar at prices below its true economic value. The true economic value or price of the dollar is the equilibrium price that balances demand and supply in the forex market. This price given the parallel market rate today is clearly above the official fixed exchange rate. The distortion in the current forex subsidy programme is obvious. This is benefiting the rich and elites more than the poor. The poor do not buy dollars. They do not process letters of credit nor buy dollars for capital investments in their companies and their subsidiaries abroad. They do not pay overseas school fees, neither do they pay mortgages abroad using our dollar commonwealth. They do not travel overseas and certainly do not buy Personal Travel Allowances at official rates. And, there is certainly very little trickle-down effect of this heavy subsidising of the dollar consumption of elites, as production inputs are priced at near parallel market rates, in the determination of market prices, even among businesses that are privileged to get the dollar at official rate. The evidence of rising inflation confirms that the current non-market, fixed forex pricing policy, despite its good intentions, has not delivered low prices of goods for the poor. There is very little evidence, even if nascent, that the anti-market economic policy orientation of the government is working. The economic growth rate is at its lowest in decades, unemployment and inflation are rising. It is now time for change. It is time for the government to let the markets work. The same distortion also happens in the petrol subsidy programme. The wealthy consume more petrol through several fuel guzzling cars per household compared to the low income who use mass-shared public transportation. The wealthy benefit more from petroleum product subsidy than the poor. The petrol product market will be more efficient if pricing reflects the true economic value at equilibrium prices that balance demand and supply. At true economic prices, demand will reduce to match available supply. This will solve the lamentation of the State Petroleum minister that thirty percent of our fuel imports are ferried across the border to Cameroun and Chad where petroleum product prices are closer to their economic value. In a market driven pricing regime, the arbitrage margin between the local price and cross-border price of petroleum product shrinks, eliminating the incentive to smuggle petrol across the border. Fuel imports and demand for dollar for fuel import will crash; the naira will appreciate with a positive spiral effect on social welfare. The private sector supply of petroleum products will also increase at market prices, reducing the pressure on NNPC to supply and fulfil virtually most of national demand. We can then save resources from NNPC and plough them to fund social investments in infrastructure, public transportation, health and education. We recognise the tough policy choices that these imply to appeal to the people to make sacrifice in the short-term for long-term and better use of their commonwealth. The resistance of the people to petrol subsidy rationalisation has been due to the series of betrayal of the people by the Nigerian state, where previous rationalisation proceeds have largely been misspent and ended up largely as corruption proceeds. The Buhari government however has the moral and patriotic credibility to appeal to the people and lead the nation to adopt necessary economic reforms. The practical options for the government are few and far between if adequate resources in the current constrained context are to be freed to make a difference in critical areas of roads, public transportation, electricity, education and health. Our argument in essence is that a fiscally constrained government, such as we have, cannot afford to distort markets in area where they are potentially efficient and create inefficiencies by its commission or omission. The social cost of such market distortions is high on society, the economy and general public welfare. While the anti-corruption stance of the Buhari government is commendable, it must embrace real economic pragmatism and allow markets to function if it will make a difference in reversing the economic downturn. There is very little evidence, even if nascent, that the anti-market economic policy orientation of the government is working. The economic growth rate is at its lowest in decades, unemployment and inflation are rising. It is now time for change. It is time for the government to let the markets work.